The 2007 edition of the Eurekahedge North American Hedge Fund Directory is printed with over 1,900 flagship funds and represents the epitome of its online counterpart, which covers 3,2381 hedge funds that currently allocate to and/or are managed out of North America. Together with this and other related information, we estimate the total size of the North American hedge fund space currently at nearly 4,800 funds managing over USD900 billion in assets. Operating in the world’s most advanced financial markets, these funds account for over half of the USD1.7 trillion parked in hedge funds globally. Historically too, the North American hedge fund universe has been sizeable (refer to Figure 1); to put it in context, their size in 2000 is comparable to the current size of the Asian hedge fund space. However, the huge influx of money into hedge funds in the region meant a squeezing out of opportunities for significant absolute returns and the pace of growth of the industry has slackened in recent years, flowing into other regions, emerging or otherwise. The industry has witnessed an annualised asset growth rate of about 18% over the past six-and-a-half years. In contrast, assets of European hedge funds grew at the rate of 62% annually during the same period. Keeping these trends in mind, we estimate assets to reach USD950 billion by end-2007. In this write-up, we review recent trends in the size, structure, growth and performance of North American hedge funds, drawing comparisons where applicable. To this end, the review is organised to give an overview of various aspects of the current structure of the industry (distribution of funds across strategies, regions of investment, asset ranges, fee components etc, and recent changes therein), as also a closer inspection of the performance trends shaping this particular hedge fund space. The hedge fund universe in North America, if not globally, is currently at a ‘high-turnover’ stage of its industry lifecycle, with many firms entering as well as leaving the market. Furthermore, the rate at which a fund absorbs assets typically depends on the strategy employed, the timing of the investments, as well as a broad ‘optimal’ size that allows a fund to remain nimble in a dynamic market environment. Taken together, these factors have led to a sustained negative skew in the distribution of funds by size, as shown in Figure 2; nearly three-fifths of the funds surveyed have assets under USD50 million each, while a mere 5% of the funds manage assets in excess of USD1 billion. 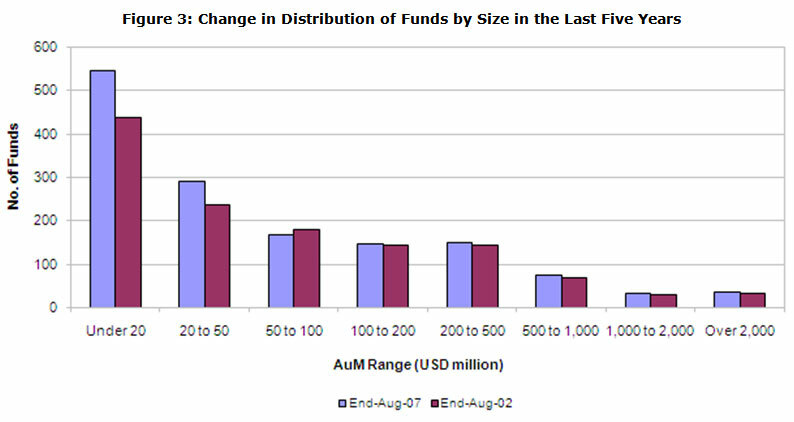 On the other hand, average fund size has been steadily on the rise, growing from USD77 million at end-2000 to the current USD188 million, as stable returns over the years have helped funds progressively outgrow their initial AuM ranges. This transition over the past five years is captured in Figure 3. 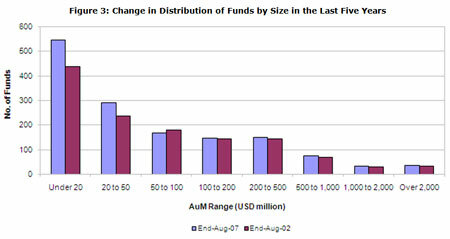 As is evident, middle-order fund sizes (USD100 million and above) have registered slight increases in the number of funds, shoring up fund size averages. 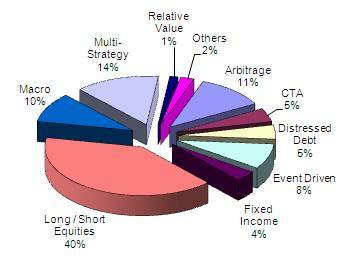 In terms of hedge fund strategies employed, Figures 4 and 5 detail the current breakdown of funds and assets managed. 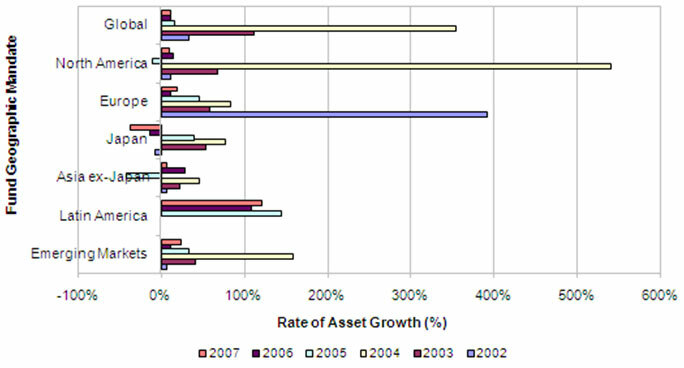 A comparison of these two figures hints at the strategy-wise direction of asset flows in recent years; apart from strategies with a global mandate such as macro and multi-strategy, opportunistic trading strategies in North America currently enjoy the largest mean fund sizes – distressed debt and event driven managers manage funds with USD230 million in assets on average. These are followed by funds that employ arbitrage strategies (some of which also include opportunistic strategies such as merger arbitrage and capital structure arbitrage) and typically manage USD200 million in assets. Examining this trend over time, Figure 6 compares the AuM shares of each of these strategies over the past five years and for 2007 up to August (with long/short equities making up the remainder of the 100% for each of the years). 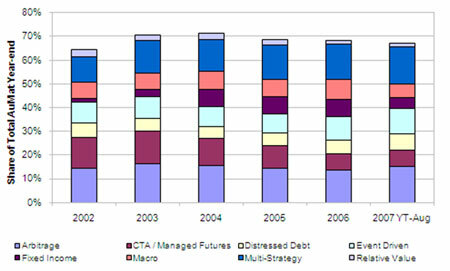 This figure further supports the afore-mentioned trend, with equity long/short strategies declining from their 2002 levels (down from a 35% to a 30% share over the years, in an environment of rapidly expanding hedge fund industry assets) into fixed income, distressed debt, directional macro and multi-strategy plays, while other pair-trading and arbitrage strategies have seen little change. In contrast, diversification across geographic mandates (of North America located funds) has been more broad-based rather than country- or region-specific, as shown in Figure 72. Although the majority of the funds continue to have global (48%) or North America- (45%) centric allocations, there has been an increasing incidence of funds with a more regional/country focus (and in particular, emerging markets in Asia and Eastern Europe, as is evident from Figure 8). Notably, growth in European and North American allocations was significant in 2004 and earlier, while emerging market assets have seen healthier growth in recent years. It must also be noted that location has a bearing on the superior growth in Latin American allocations (as opposed to Asia ex-Japan allocations). 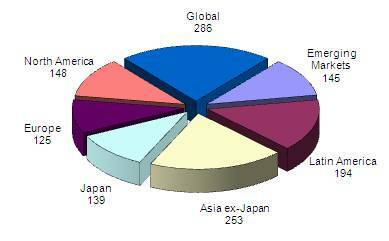 That said, global fund managers have been increasing their presence in emerging markets in general, and Asia in particular, in recent years. 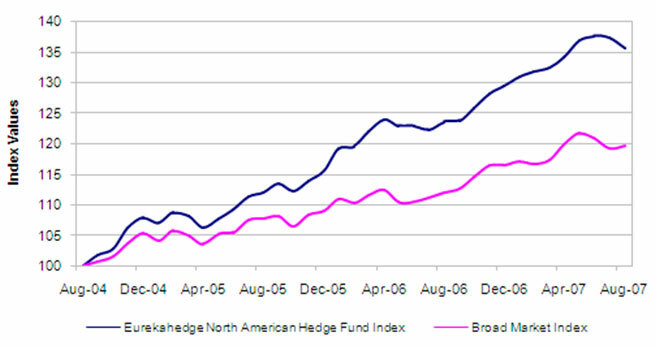 This trend of expanding emerging market asset shares is further supported by Figure 8, which compares the current average size (in USD million) of North America-based hedge funds by geographic mandate, as signified by the greater average size of funds focusing on Latin America and emerging Asia, over that of North America-focused funds. There is a certain demand-supply dynamic at play in an industry that is witnessing many firms enter and leave the market. We set out to examine whether this has had an upward or downward pressure on overall hedge fund incentive fees. 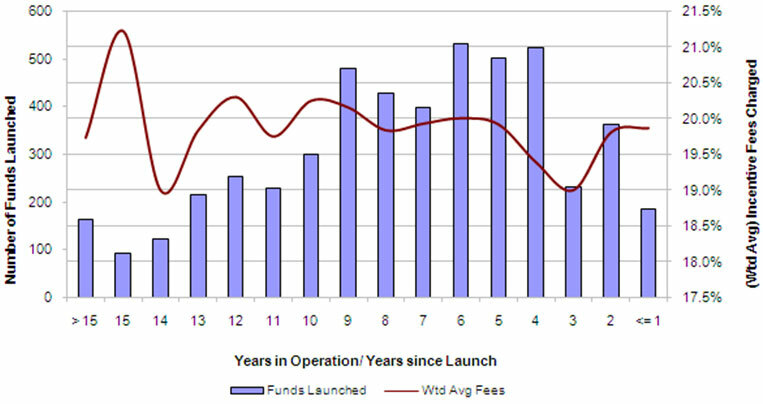 In order to do so, we compared the weighted average incentive fees charged by hedge funds of different ages on the one hand, and new hedge fund launch activity over the past 15 years on the other (Figure 9). Adjusting for short-term highs and lows from year to year, Figure 9 shows a perceivable downward trend in average fees charged. Notably, in the last seven years, a marked increase in the number of start-ups has had the effect of initially steep, then flattening, fee rates. Looking at the same graph from a different perspective, older funds distinguish themselves from more recent entrants with their longer track records, and hence, can command higher fees. A comparison of average hedge fund size by fees charged also supports this. 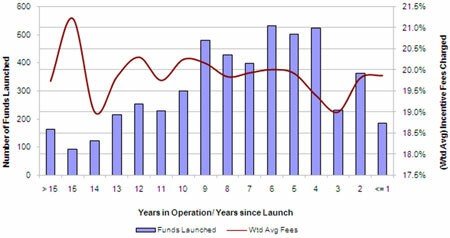 Although average fund size is on the rise (billion-dollar launches are no longer unheard of), hedge funds have traditionally started on a smaller scale (over one-third of the hedge funds surveyed had assets under USD20 million each, whereas funds with over USD1 billion in assets accounted for a mere 5%) and tend to have an optimum size beyond which returns begin to diminish. So, on a comparison of average fund size and fees charged, we observed that the two share a direct relationship; funds that are larger in size, can conceivably attract capital through either superior trading strategies or longer track records or both, and hence can afford to charge higher fees. North American hedge funds have traditionally offered very stable returns (annualised returns of 12% over the last seven years and a Sharpe ratio of 1.6, on average). But how do these returns compare against those in underlying asset classes? In an attempt to very roughly estimate the alpha generated by North American hedge funds, we constructed a hypothetical benchmark index of equities, bonds and commodities by: a) combining three broad US market indices viz the S&P 500 equity Index, the Dow Jones Corporate Bond Index and the Reuters/Jefferies-CRB commodity Index), and b) assigning weights3 approximately equal to the AuM shares for hedge fund strategies in these respective asset classes (refer to Figure 4). We then compared the performance of the resultant benchmark index with that of the Eurekahedge North American Hedge Fund Index for the past three years (up to Aug-07), depicted graphically in Figure 10. 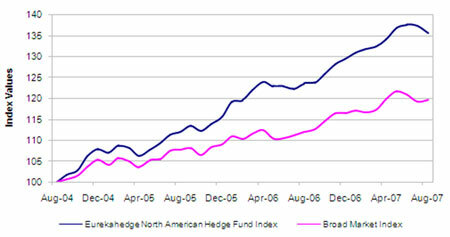 The hedge fund index had a beta of 0.83 with respect to the broad market index. At an assumed risk-free rate of 4% per annum, this translates into a Jensen’s alpha of 4.9% (on an annualised basis) for the portfolio of North American hedge funds. The following section takes a closer look at how returns across various industry participants are dispersed, and what, if any, is the impact of factors such as size and strategy employed, on performance. 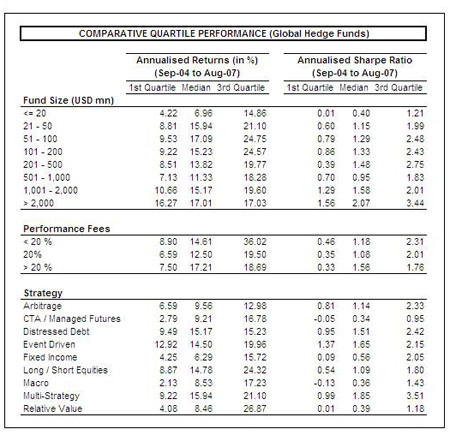 Table 1 below compares the quartile dispersion of returns (annualised as well as risk-adjusted, over the past three years) across various modes of alternative investment such as long-only absolute return funds (ARFs) and funds of hedge funds (FoFs), as also regional hedge fund vehicles in Latin America, Europe and Asia4. While the data supports what has been said earlier about the superior performance of fund allocations in the emerging markets, it is notable that median and upper quartile returns in North American hedge fund allocations are comparable to those in Asia and Europe, and have outperformed fund of funds returns. Returns from long-only strategies, and to a lesser extent from Latin American allocations, were assisted by strong bullish sentiment and upward trending markets during the period in question. This is apparent from a comparison of the returns generated by ARFs and North American hedge funds during periods of market volatility/corrections, for instance, in May and June 2006; the former lost as much as 6% on average while the latter were down less than 1%. Similar was the case during the market downturn during July/August 2007. 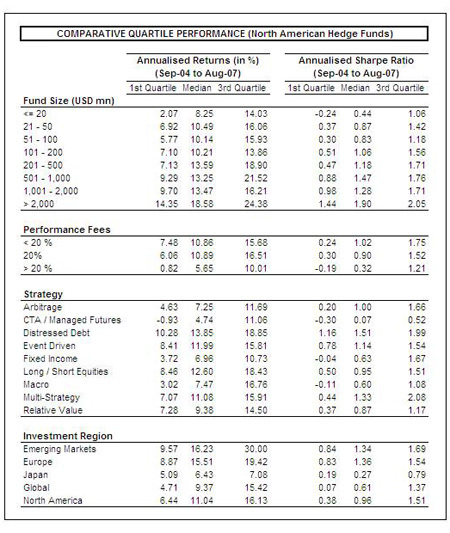 The dispersion of risk-adjusted returns among the various fund types in Table 1, further illustrates the above: the Sharpe ratios of North American allocations are on par with those in Asia and Europe as well as with those in ARFs and FoFs. In terms of fund size, larger funds in North America have fared better than those elsewhere, while smaller funds performed better in non-US markets; for instance, 25% of the North American funds with assets in excess of USD2 billion, returned upwards of 24%, while elsewhere 3rd quartile returns for that size bracket were about 18%. This suggests the relative advantages of leverage and diversification, when operating in more efficient markets. Nearly 90% of the funds surveyed charge an incentive fee of 20%, so it is understandable that return dispersions vary so widely between funds with atypical fee structures. But among the ‘20% fee’ funds, particularly in the top two quartiles, those allocating to non-US markets enjoyed better returns over the last three years than their North American counterparts. As illustrated in an earlier section on fees, this is owing to the higher average age and longer track record of the latter. Return spreads across strategies also show a similar pattern of slightly better returns among non-US funds, with significant variations justified by the performance of respective underlying markets. For instance, the North American component of the MSCI (equity) Index rose 12% per annum over the last three years, while the World ex-USA component gained about 20% per annum. This translates into a 6 percentage point gap in the 3rd quartile returns of equity long/short funds in North America (18.4%) and elsewhere (24.3%). Similarly, a wider scope of opportunities in the high yield and distressed debt spaces (until the correction in July/August 2007), have helped North American distressed debt funds net higher gains on average than their counterparts elsewhere, with the former’s 3rd quartile returns at 19% to the latter’s 15%. The North American hedge fund universe is a mature space commanding sizeable assets (still accounting for over half of global hedge fund assets), offering stable returns and keeping pace with the evolving hedge fund scene in terms of expanding into newer markets and opportunity sets; the share of emerging market allocations of assets with US-based managers has nearly doubled over the last year, growing from 4% 12 months ago to the current 7%. 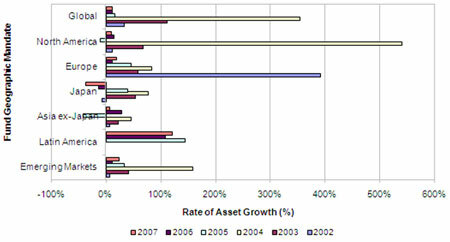 Asset growth rates in recent years have also been higher in developing markets and/or in opportunistic strategies. In terms of performance, North American funds continue to offer consistent (relative to other regional hedge funds) and solid (in absolute terms) returns; on average, allocations in the region have returned upwards of 10% per annum over the past three years. We also noticed that North American funds with a large asset base (> USD2 billion) have fared arguably better than their counterparts elsewhere, getting the most mileage out of their global allocations. On the macroeconomic front, after the turbulent markets in recent months – as concerns over distress in the credit markets grew and spilled over into other asset classes in Aug-07, sending risk aversion, volatility and borrowing costs up – we expect another spell of healthy markets in the coming months. This is owing to several positive signs emanating from major central banks’ actions (the Federal Reserve cut both its discount rate and the short-term interest rate by 50 bps in the last two months with expectations of another 50 bps cut in the latter by the year-end; the Fed was also joined by the European Central Bank and the Bank of Japan, among others, in quelling concerns over liquidity in the markets). Furthermore, negative third quarter earnings reports from major banks and other institutions in early October suggest very attractive valuations, further helping buoy risk appetites in the coming months. 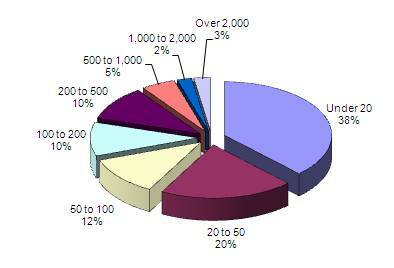 1 As at 4 Oct 2007 and in addition to another 591 obsolete funds. 2 In contrast with Figure 6, this graph compares changes in the asset growth as opposed to changes in the asset-mix, so as not to let the very large values (of global and North American allocations) drown out the smaller ones (of emerging markets and European allocations). 3 The weights assigned were as follows: 50% for the equity index, and 10% each for the bond and commodity indices. 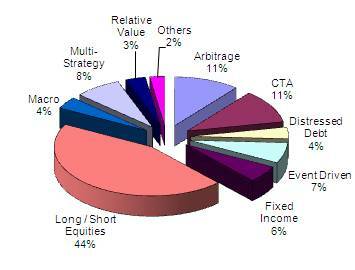 4 The survey comprised of 1,685 funds in all, including 1,004 hedge funds, 583 funds of funds and 98 long-only funds.